Views from the loch. : A job well done! Photo 01 - Halfway done! As we mentioned last week Davy and Rab had elected to take on the tedious but necessary task of removing the thick carpet of moss that accumulates on the roof of our boathouse particularly on the west side. When we arrived they had the ladders out and were gathering the necessary tools required to carry out the work. After a blether mostly focused on what Davy had caught during the week which incidentally included an eighteen pounder and a fifteen pounder using a couple of new lures, no secret, just time put in and diligence in his endeavours! After looking at the photos we decided there was nothing for it but to set about the task in hand. Now we have a couple of handmade bespoke tools with the teeth cut out to match the ridges and furrows of the asbestos sheeting with one on a pole and the other much shorter hand held. Unfortunately whilst the tools had the correct contours on some parts of the rood on others they just slid along the top of the heavy carpet of moss. 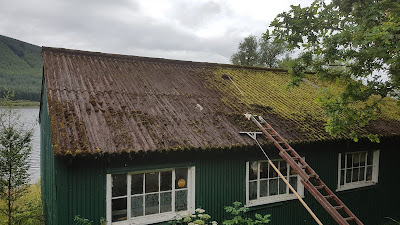 So it was do what we can with the tools and augment this with the most tiresome procedure of removing the moss with paint scrapers. Luckily at this point Davie and Stuart appeared and helped ease the workload. 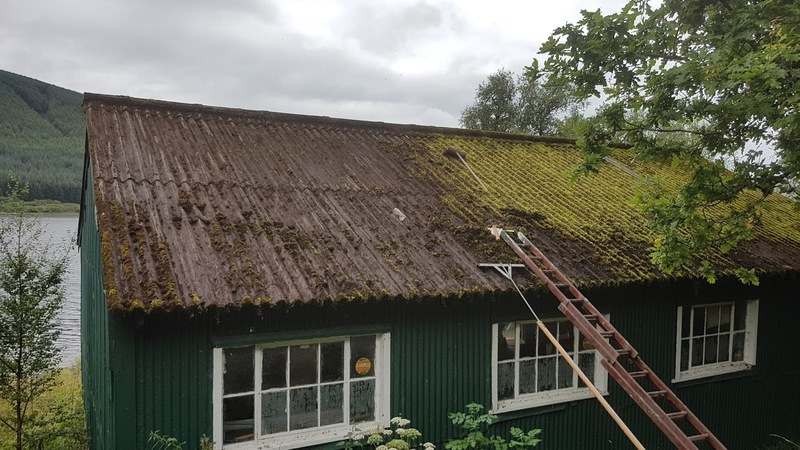 With all of us on the roof another problem reared its head and that was once the damp moss was removed the roof was transformed into an ice rink! Yes we were sliding all over the place and safety became a major concern however with no readily to hand solution we proceeded gingerly! These little scrapers took a toll on our hands with cuts and bruises everywhere, but after 4 hours the job was done and although it was tough going the end result was well worth it! We were battle weary, soaked through and absolutely black and we took a decision to postpone the spraying until the roof was completely dry. Thanks to Davie and Stuart for their timely intervention which prevented thanatoid thoughts and extra special thanks to Davy and Rab for seeing the task through from planning to completion, all valued members of the club! Photo 02 - The job done! This weekend of course sees the sailing club holding their annual Regatta and they were kind enough to inform us that the event would be taking place and that sensitivity would be employed in course planning. 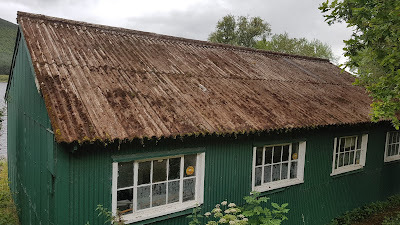 Well today I received a call from their commodore Gerry Ailsa saying that due to a change in wind direction they would again be operating in the vicinity of our boathouse. He stressed however that they would have the marker as far out as possible but thought it best to inform us of the new situation. As of next season we will receive a timetable card highlighting the various events so all our anglers can see what is taking place, this will appear in the boathouse and on the web so anglers can better plan their days. Now that’s what I call good communication! Interestingly during a conversation with Gerry he said that the sailing club have also had troubles with canoeists! Every now and then we encounter an angler who has come away without his gear and of course that’s a problem as most visitors even members live a good way from the loch. Over the years we have built up a collection of tackle items kindly donated by our members. We have various rods and reels, wire traces, flies and the latest additions kindly donated by Gordon McClurg are a brand new landing net and a very sturdy professionally made wading stick! Now our stock has increased all members should be aware of this last chance safety net just see Jenny oh and Thanks Gordon!